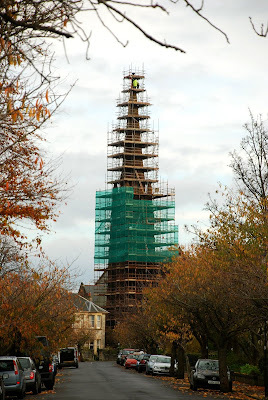 ARPL Architects Ltd announce that scaffolding has gone up and repair work started on the tower and spire of B-listed St Andrew’s Parish Church in Ayr. A Heritage Lottery Fund grant has been received for the repair of stonework, finial and stained glass, work which is due to be completed by late Spring 2010. The project architect, Lynne Yuille of ARPL Architects Ltd, is seen above at the top of the scaffold carrying out detailed inspection for the £150K repair work. The congregation of St Andrew’s Church, Ayr were very pleased to be awarded a grant from the Heritage Lottery Fund to cover 2/3 of the costs of the work. The main contractor for the project is Fleming Masonry Contractors Ltd of Glasgow, who are specialists in conservation work. Earlier this year steeplejacks carried out emergency stabilisation of the finial and crown stone at the top of the spire, and the project as a whole was started after storm damage to the tower louvres. ARPL Architects Ltd director in charge of the project Rebecca Cadie said: “We are very pleased to get this local landmark project on to site, and despite the winter weather, good progress is being made to repair the finial, spire, bell louvres and large west window. The directors of ARPL Architects Ltd are Patrick Lorimer, Robert Gilliland, Gordon Fleming, and Rebecca Cadie with John Ramsay, Stewart Glendinning and Kenneth Handley as associates. The ARPL philosophy is to produce buildings to the highest design standards in close consultation with its clients. Designs are innovative and sympathetic to both the immediate and the broader environment in which they are constructed, with an emphasis on sustainability. Each project embraces the unique nature of the client’s needs and the site. Over the 36 years since Patrick Lorimer established the original practice, ARPL’s status in the profession has grown steadily in line with its position as a medium-sized practice with a reputation for well executed projects. From its base in Ayr the practice carries out projects over a wide geographical area from the Orkneys and the Western Isles to Ireland. The firm’s project experience covers the fields of housing, churches, schools, commercial projects, private houses, community and arts buildings. Particular expertise has been developed in contemporary sustainable design, specialist conservation works and design for historically sensitive environments. ARPL’s work has received wide recognition through numerous design and environmental awards presented over the years for its new build and conservation works. Regular success in design competitions adds to the practice portfolio. ARPL are currently working on new and refurbishment housing for Lochside, Ayr, several church and castle conservation and restoration projects and new community facilities in the South West of Scotland. Appointments for church commissions involve a range of denominations and projects from conservation and repair to extensions and new build. The firm is also involved in country houses and estates and the design of new houses for private owners. The practice typically handles projects with construction values ranging from £100k through to £15m. ARPL directors have managed to keep their business stable during the current difficult times, and have a busy current workload. ARPL Architects Ltd is a founder member of the Elite Ayrshire Business Circle. There are currently 630 Ayrshire business stories permanently archived on this site. To locate those of most interest to you, please use the site search facility in the top left hand corner of this page. Type your search term in the white box, then click the magnifying glass symbol.